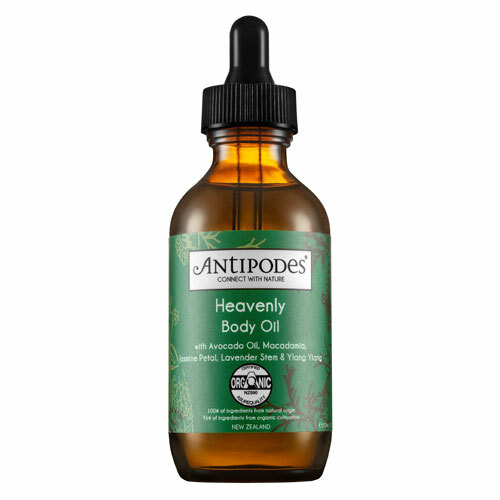 A light and non-greasy body oil with the seductive fragrance of a New Zealand summer`s night. Rich, healthy, premium cetified organic oils of avocado, macadamia nut, jojoba and rosehip absorb easily into your skin, leaving it as smooth as silk. Suited to most skin conditions, especially ultra-dry. Persea gratissima (avocado) oil*, Macadamia ternifolia (macadamia nut) oil*, Buxus chinensis (jojoba) oil*, Rosa canina (rosehip) oil*, tocopherol (Vitamin E), essential oil fragrances of jasmine, lavender & ylang ylang: benzyl benzoate+, benzyl salicylate+, citral+, citronellol+, coumarin+, d-Limonene+, farnesol+, geraniol+, isoeugenol+, linalool+. + Component of essential oil, * Certified organic ingredient. Smooth over your entire body after you bathe at sunrise, or any time at all after sunset. 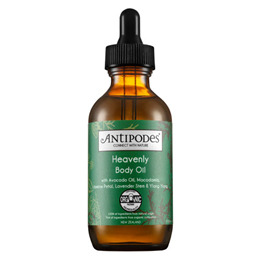 Below are reviews of Antipodes Heavenly Body Oil - 100ml by bodykind customers. If you have tried this product we'd love to hear what you think so please leave a review. Rich, healthy, certified organic oils of avocado, macadamia, jojoba and rosehip absorb easily into your skin, leaving it as smooth as silk.